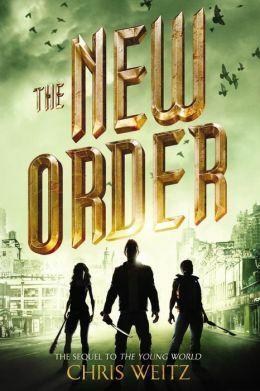 Chris Weitz The New Order is the second book of The Young World trilogy. Jefferson and Donna were sure the arrival of the military meant an end to this nightmare- a hellish two years full of enemy gangs, gunfire, and lost loved ones. But the cruel plans the government has for the remaining teens are beyond anything they could've imagined. All Jefferson and Dona want is to have a future with each other, but fate has different plans, and they soon find themselves pulled apart. Jefferson returns to New York City with a cure for the Sickness, and a hope to unite all the tribes. And Donna finds herself in England, facing an unimaginable world. With the help of new and familiar faces, their survival and the hope for a new world hang in a delicate balance. Can the two reunite and prevent an even greater disaster than the Sickness? 1. It took me a little longer to really get into this book than the first book, but once Weitz gets into the meat of the story, it gets hard to put down. I loved learning about the world outside of New York and how they handled the Sickness. 2. Love how Weitz gives Donna and Jefferson such distinct voices in their own chapters. In this book, other characters start getting their own chapters, and they are just as unique as the original characters. Although, it was a little rough reading Brainbox's chapters. 3. I loved that there were deeper agenda's going with both Donna's group in England and Jefferson's in New York. This gave the story some real depth, and really threw some surprise punches in there. Again, with the ending, Weitz has me dying for the next book.